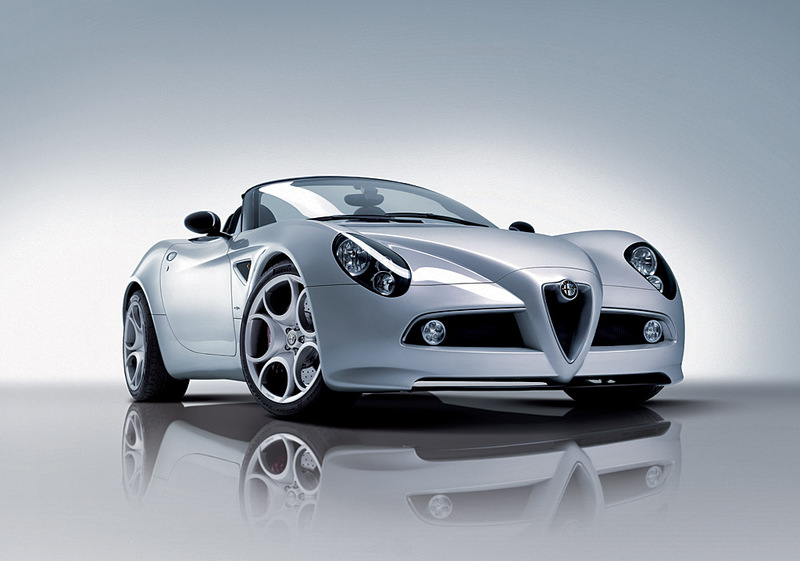 19/02/2008 – Alfa Romeo once again unveils its new models onto the world market at the Geneva event. 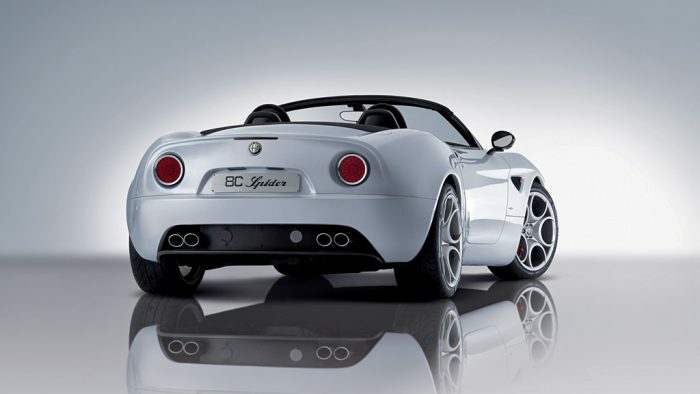 Indeed, following on from the Alfa 159 and Brera in 2005, the 159 Sportwagon and Spider in 2006, and its Personalisation Programme going by the name of “Alfa Unica” in 2007, it is now the turn of the alluring Alfa 8C Spider. Like the Alfa 8C Competizione, the Gran Turismo which received resounding global praise; the new “discovery” will be produced in a limited edition run of 500. Elaborated by the Centro Stile Alfa Romeo, the new car re-affirms the brand’s excellence in this sector, as shown by some Spider’s being regarded among the most beautiful cars in global automotive history. Cars such as the Giulietta Spider from the 50’s or the legendary Duetto made famous by “The Graduate” from 1967 with a young Dustin Hoffman. Today, it’s the Alfa 8C Spider’s turn to take centre stage and project into the future the values of technology and emotion which belong to the Alfa Romeo legacy. Obviously, the new vehicle inherits all the winning features of the Coupè version. Starting with the two “sport seats” setup and the fascinating exterior lines, which characterized by sculpted and finely designed bodywork, “dress” the automotive and mechanical excellence of the model. In detail, the marked dynamics of the vehicle are highlighted by the horizontal groove “built” into the bonnet at wheel level. The oversize wheels and powerful “muscles” of the rear mudguard accentuate the personality and force of the model, without diminishing the elegance of those fluid lines. Instead they highlight the formal beauty of the singular external features: the “teardrop” fog lights set like a precious jewel in the front mudguard, the front Led lights, a synthesis of technology and rationality, and the essential door handle. Furthermore, in the front we can find the characteristic Alfa Romeo stylings, with a new interpretaion of the “whiskers” and shield. Without forgetting, that this innovative range anticipates the elements and proportions of the future Alfa Romeo cars, always with complete respect for the historical legacy of the brand. 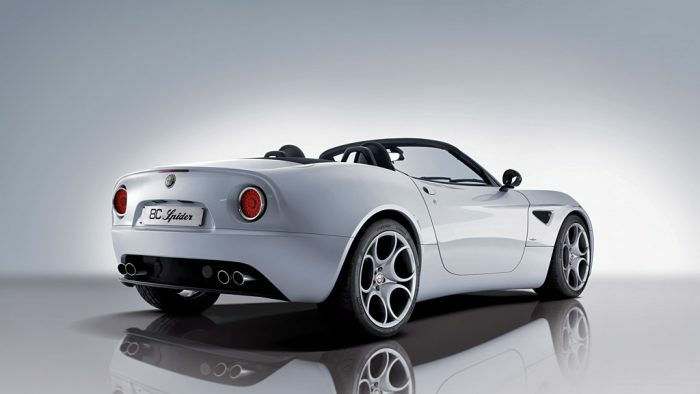 It’s worth underlining that to reach these top levels of areo-dynamic efficiency, solutions which don’t limit themselves to the design of the form have been adopted on the Alfa 8C Spider. All the surfaces and profiles of the uprights and windows, together with the form and positioning of the rear-view mirrors, have been optimized using computer models and tests in wind tunnels and real-life environments. As a result, air flows round the vehicle following it’s natural path, unhampered by corners and irregularities. The end result is a negative LC (lift coefficient) which like competition vehicles, contributes to stability at high speeds. But the peculiarity of this vehicle, is the hooded top fitted with electro-hydraulic automatic control (controllable via a button on the dashboard). The hooded top of the Alfa 8C Spider is composed of two overlapping sheets: the external one is made with a multi-thread textile which can withstand the elements, whilst the interior has high sound-proofing qualities. Furthermore, the hooded roof-top, available in various colours, has been perfected aesthetically, aerodynamically and for acoustic comfort. It has also been perfected from a functional point of view, with specially developed film-reels to render more agile, rapid and secure any explanations of the functioning. In the interior, the Alfa 8C Spider guarantees a sophisticated environment, thanks to the vast use of composite materials in the dashboard and internal panels, as well as the use of anatomical seats, produced in carbon fibres, that can be adjusted according to the physical characteristics of the driver (up to now, a feature only available to racing cars). Furthermore, for maximum possible personalization of the interior, the client can chose between different environments and aesthetic solutions. All distinguishable by the particular attention to detail and artisan workmanship: from the contrasting stitches, colour tone and exclusive matchings. The bucket seats are upholstered in Frau flower leather (an exclusive and innovative treatment of the weave, in which the leather is bound to a natural fibre, creating a look of great visual impact). In analogous fashion to the interior, the same care has been taken in realizing the exteriors: from the alloy wheels to the brake calipers, every detail can be chosen to your particular design, because every Alfa 8C Spider can only look similar to itself. An unmistakable car made to measure for the owner’s personality. 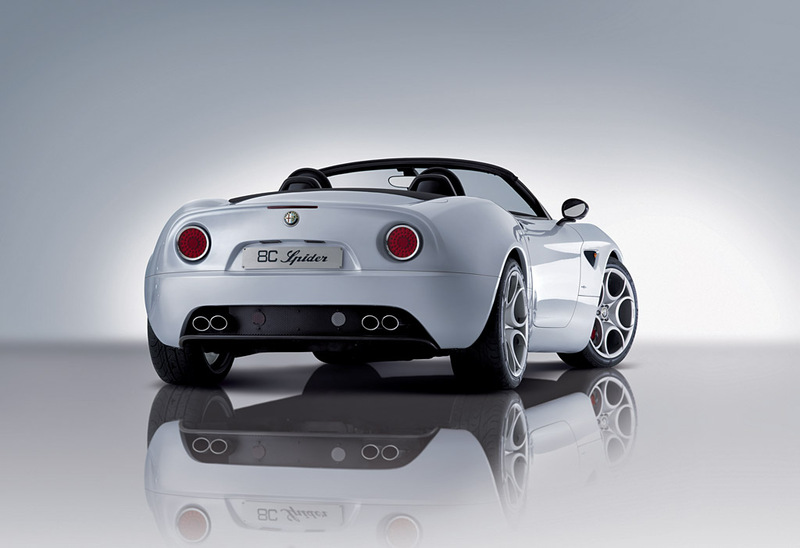 The unique and un-repeatable Alfa 8C Spider announces the pleasure of a sporty drive with full respect for the brand’s legacy. Like in the best Alfa Romeo tradition, hidden under this pretty “dress” is the best of what’s available in the field of mechanics and propulsions. Firstly, the Alfa 8C Spider has a rigid and light structure (the compact frame is made in steel for maximum torsion to guarantee a drive which is always precise and sure, whilst the body is in carbon fibre). We are dealing with a choice motivated by the need to reduce as much as possible the weight but also to optimize the centre of gravity for agility and drive-ability in the more demanding journeys. Still under the banner of sophisticated technology, the Alfa 8C Spider adopts the new “8 cylinder mated to a 5-speed gearbox with 90°” and a capacity of 4691 cm3 which has been designed with one specific aim: guarantee extraordinary performances without relinquishing the fluidity of the gearshift or the ease of use in any driving context. Like so, a powerful and progressive propulsion is born with a top power of 450 CV at 7.000 rpm and a maximum torque of 7.500 rpm. This engine has been mated to a self-shifting 6-speed gearshift (with computerized selection of the gears via levers behind the steering-wheel), and a self-blocking differential unit. As in the legendary Formula 1 vehicles from the 50’s, the Alfa 8C Spider sports the Transaxle design which guarantees the best equilibrium in the partioning of weight. The propulsion is placed in the rear whilst the gearshift is placed behind along the differential and hydraulic motor unit. The Transaxle design foresees a tight connection between motor and gearshift, which is fitted with a self-blocking differential. The two groups are linked by a tubular element, at the interior of which rotates the transmission driving shaft: in this manner the load is distributed in an optimal manner between the front and rear suspension. So much power can only be entrusted to an excellent braking system: the Alfa 8C Spider is fitted with carbo-ceramic Brembo (CCM), 380 mm in diameter on the front-wheels and 360 mm on the back-wheels. This solution guarantees a powerful brake action even in the most intense uses. The marked reduction in weight, in comparison to a traditional set-up, reduces the masses unsupported by the vehicle and so improves the dynamic performance and driving comfort. Furthermore, the mono-block calipers guarantee maximum rigidity and minimal deformation, given the high loads generated by the pressure of the pistons on the brake-linings. Therefore, the Alfa 8C Spider “declares itself Alfa” all the way, confirming control and driving pleasure with no compromises. Since always, gear comfort and dynamic performance are qualities specific to Alfa Romeo cars: in this case they have become veritable strong points. Thanks to for example, the suspensions which foresee a high wishbone suspension with brackets and uprights in forged aluminium, that act as a supplementary strut for alignment control. Contributing also to the brilliant road control are specially developed 20” tyres to insure excellent performance, the tyres have a: 245/35 front-suspension and a rear-suspension of 285/35. Fitted on perforated rims in fluid moulded aluminium to ensure lightness and maximum brake ventilation efficiency. Lastly, the Alfa 8C Spider uses an evolved VDC Alfa Romeo traction and stability system, which ensures the driver feels at one with his car. 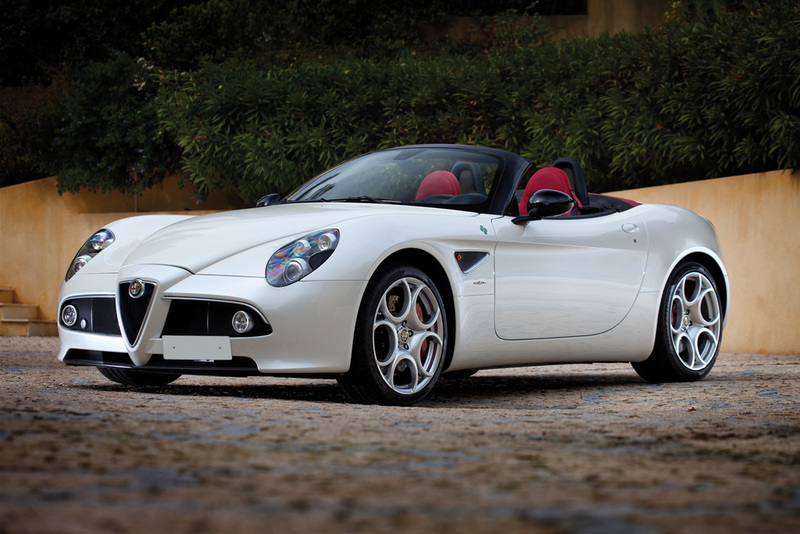 2010 Alfa Romeo 8C Spider ZAR92000000050053 – sold for €201,600 One of 500 examples built; one of just 11 sold new in France. Shell White pearlescent paint . Fitted with every available factory option. Single ownership and less than 2,250 kilometres from new. quadrifoglio painted on the front wings, red brake callipers, 20-inch “telephone” wheels, a Becker stereo with CD/MP3/Bluetooth capabilities, and rain-sensing windshield wipers.